Monday through Wednesday have been primarily travel days. We arrived at our new location by early to mid-afternoon each day and have cleaned and made small repairs, many of us are looking forward to getting back to the Lower 48 to do some serious cleaning and maintenance. 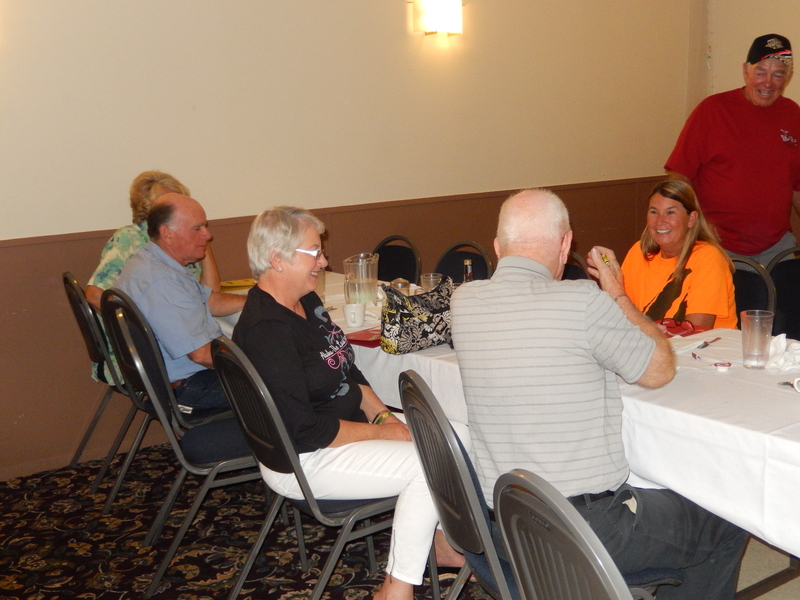 Tuesday night we gathered for a spaghetti dinner at the “Wolf It Down” restaurant in Watkins Lake and a game of Bingo. We used decks of playing cards instead of normal Bingo equipment and it was a lot of fun! We arrived this afternoon in Hyder, AK at the Camp Run-A-Muck RV Park (Who names these places?!). 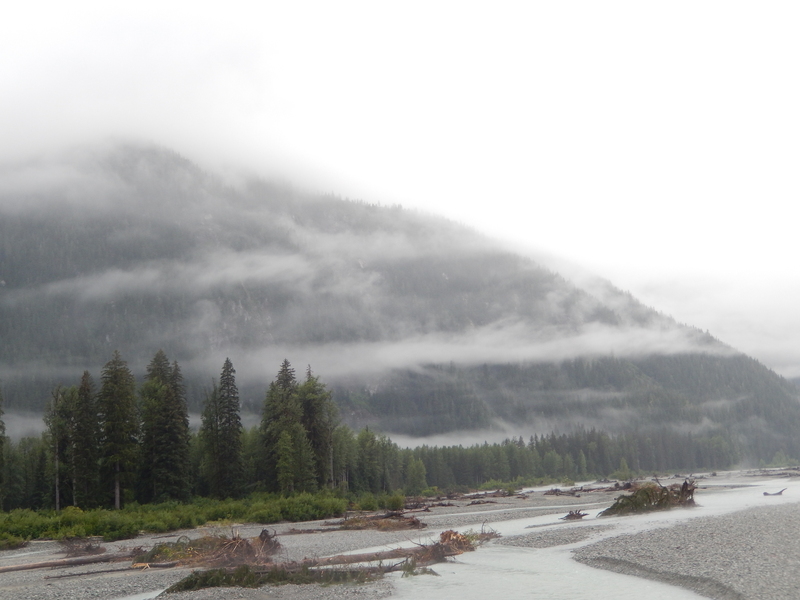 This is the rain forest area of Alaska and it is raining. We have been cocoons through the afternoon, but hope to get to a glacier and see some bears near the Fish Creek Bridge. 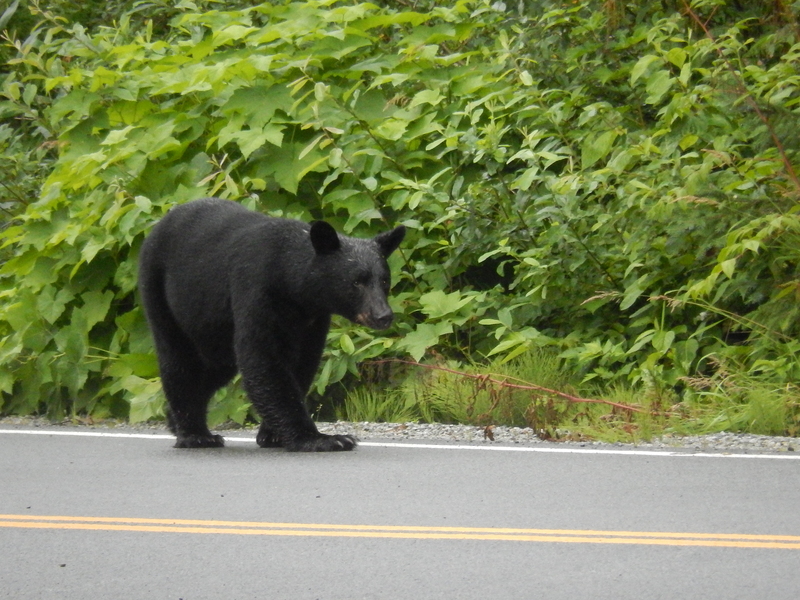 On the drive to Hyder Pat and I spotted a black bear crossing the road in front of us. We had to stop because we couldn’t get past it. Then we watched it head up the hill and join a couple of cubs, so it must have been the mother. As we drove on we saw another larger bear. This is the closest we have been to any bears this trip. We were up at 5:45 to go to the Fish Creek Boardwalk to watch bears feeding on the salmon as they come upstream to spawn. There were plenty of people, plenty of mosquitoes, but no bears. We then joined three other couples for breakfast at the Glacier Inn. It may not have been very fancy but the omelet was great! Later that morning we drove to the Salmon Glacier. 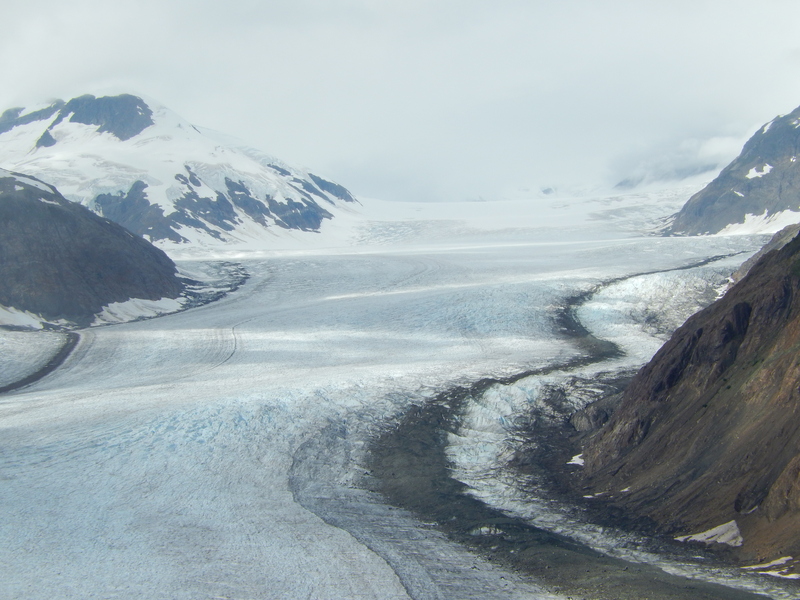 This is the fifth largest glacier in North America – it is huge! We drove down a gravel mining road and were able to look down on the toe of the glacier, then drove for several miles to get to the summit. When we got there we were in a cloud and couldn’t see a thing. However, there was a guy who literally camps there to sell books, postcards, and DVDs. He told us if we went another two kilometers down the road, we could see everything. 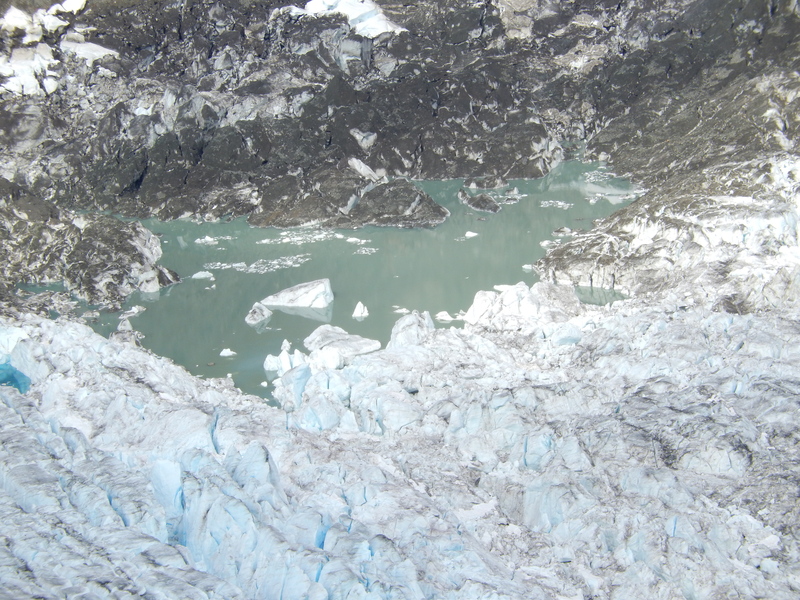 Sure enough, we drove below the clouds and had a clear view of the glacier and could see how it splits into two glaciers. We could see small ponds at the bottom of the shorter one where it is melting. It has been raining since we got here, with some small breaks. The Alaskan rain forest is the greenest part of the entire state. It is lush and some of the trees here are enormous. You never think of this kind of climate when you think about Alaska. After dinner we went back to the Fish Creek Boardwalk, but this time we were lucky. 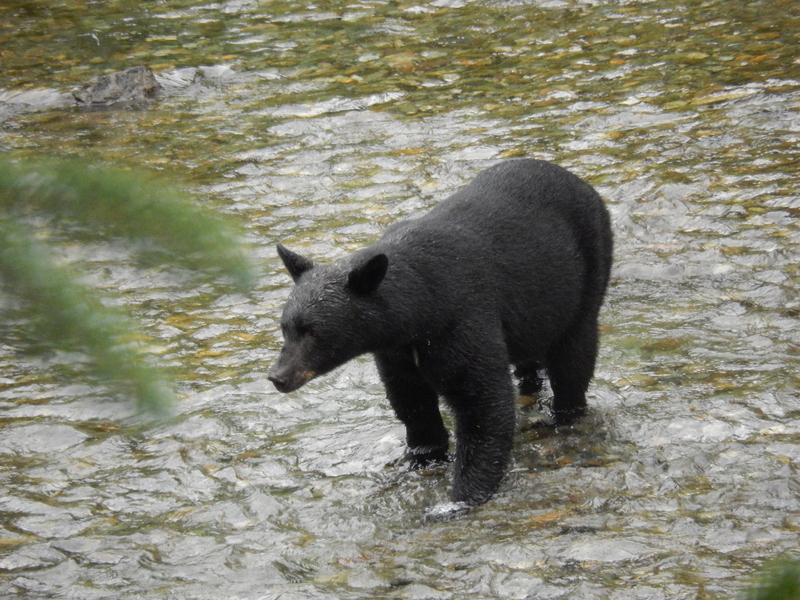 We saw a bear walk down the road to the river. He tried twice to catch a salmon in the water, but after two unsuccessful tries, he took the easy way out and found a half-eaten one on the shore and took it into the woods to eat. We are definitely on the home stretch now, with only two days left and all of it driving. We camped at an RV park in Smithers, BC and left the next morning for our final day. Everett, our tail gunner, celebrated our last day on the road by providing Tim Horton donuts with our morning coffee. That’s one thing I will miss after the caravan, having someone make coffee for me in the mornings we are driving. We pulled into Prince George, our final stop, and ran the truck and trailer through a truck wash. We thought we had to get at least the first layer of dirt off the rig – it has been through a lot this trip. That night we met for our final dinner together. Vicki, our Trek Master, handed out folders she had made with updated pictures and a journal she had kept through the trip. It was a nice time as everyone reflected on what we valued most from the caravan, but sort of sad as we realized this was the last time we would be together. It was almost surprising how strong many of the relationships had formed in only fifty days. Well, the caravan officially ended with dinner last night, but we still have to get back to the USA. We were looking at two long days and were on the road early in the morning. We could definitely tell we were back in civilization as the roads were in great shape. 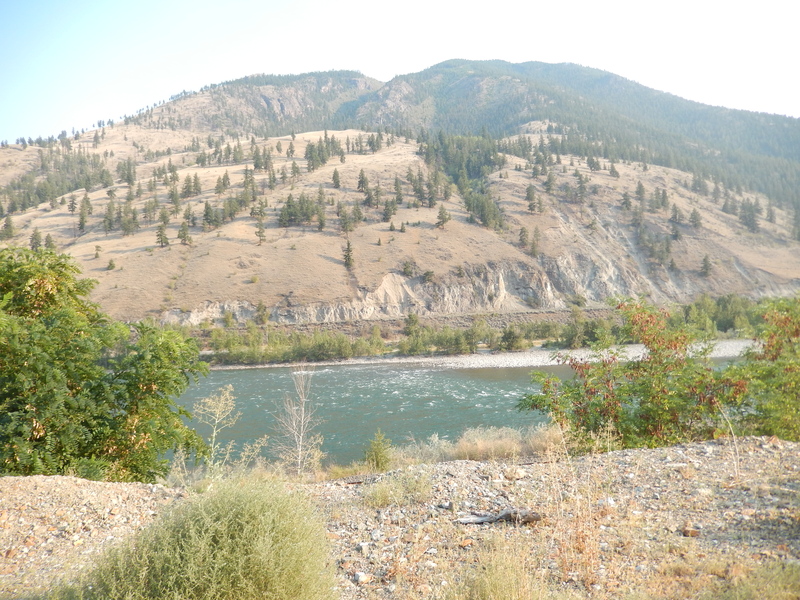 We drove the Cariboo Highway south to Spences Bridge. We made a stop for lunch at the 108 Mile Ranch, a heritage site. This is near the small town of 100 Mile. These places are whatever mileage they are from some spot, I never discovered what that spot was for the 108 Mile Ranch. 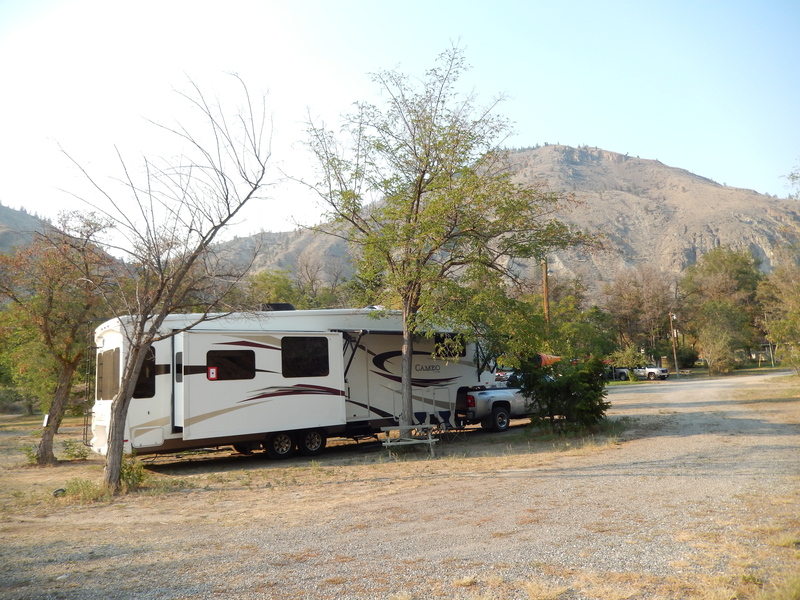 We spent the night at a small RV park and were treated to some great views, which included a small black bear that wandered by our campsite. From Spences Bridge we drove the TransCanada Highway as it followed the Fraser River. What great scenery! The road was winding, and we went up and down hills, but we had the road to ourselves most of the morning. Shortly after lunch we crossed back into the USA – next stop Camp Murray Beach campground near Tacoma, WA. It has been a great trip and a wonderful experience. 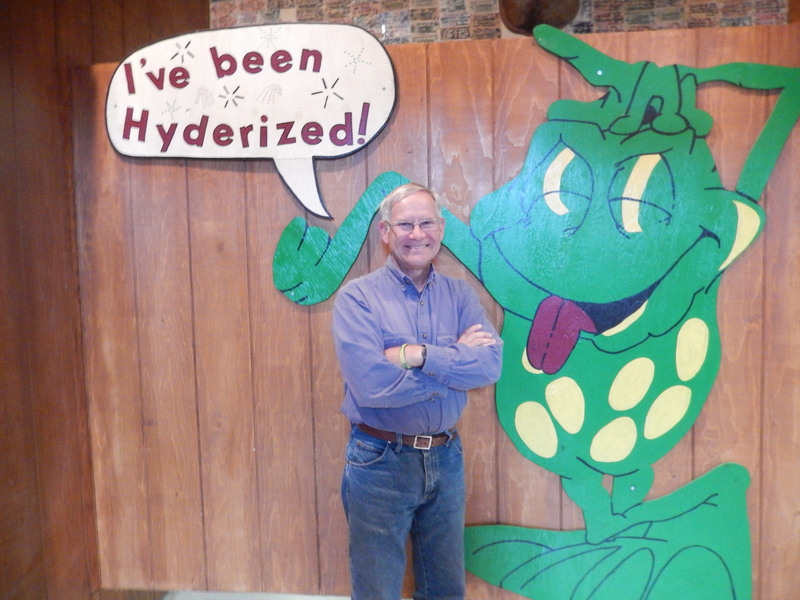 This entry was posted in Adventure Treks, Alaska, Alaska RV Caravan, Fulltime RV, Michigan Traveler and tagged Cariboo Highway, Hyder, Prince George, Salmon Glacier, Tail Gunner, TransCanada Highway, Trek Master. Bookmark the permalink.